Here's to a Happy Halloween! 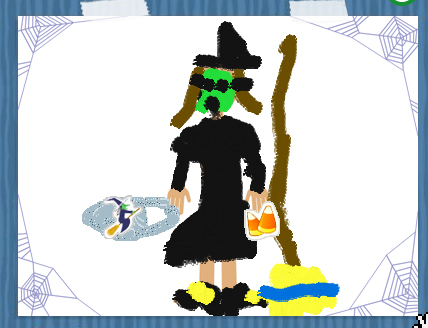 Ava drew this in the computer on Noggin's site last year for Halloween. Belt out your best witch's cackle right now. 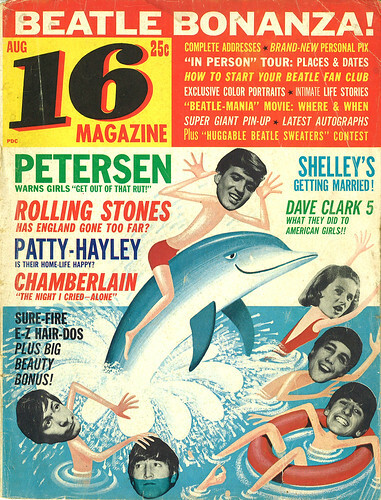 Vintage magazine image from the collection of Glen Mullaly. Check out his artwork, too! Great artist. Glen is a constant contributor to The Retro Kid. Don't forget to check out my former identities: Ghosts of Halloween Past. Mom found that one photo of me with that funny bunny outfit when I was one, but it's now deep in the confines of all my stuff from the Big Move. I promise I'll post it when I find it. And lastly, I want to wish Ollie Johnston, the last surviving member of Disney's Nine Old Men, a very happy birthday. He's a youthful 95! Having a blog has offered my friends and family the best opportunity to keep up with what I've been up to. Although, I realize that there's not much in my updating, plus most of the stuff I write and post about are not in the "hey, this is what I've been up to lately" sort of vein. There are some interesting anecdotes to be found here and there, but not enough for a regular reader to expect on a continuing basis. Posting about my life here seems sort of odd to me, even though, yes, this is a blog and blogs are supposed to be repositories for intriguing and interesting life stories. Or are they? Blogs are what you make them and here, well, anything goes. Obviously, there are other options to stay connected with loved ones. It's practically a sin NOT have a myspace account, right? Well, I never wanted one. An ugly, UGLY website that means practically nothing to me. (Look, I'm not even going to link it. Take that, myspace!) Ugly in the sense of visuals, audio and navigation. I know that having a myspace page has become the hottest thing to do this day and age -- it's great for musicians to connect with their fanbase (even that's been tainted by some groups hiring an internet lackey to hook up programs that automatically "friend" people out there -- a Web 2.0 loophole, I guess) -- but the site is glaringly cumbersome and fraught with spam comments, ads and irritating fake accounts from "girls" who "saw my icon and thought I was cute but can't seem to figure this all out, can you help me?" Yeah, right. I'm not stupid, people. I have a myspace page up, but don't bother friending me. I probably won't update it because, really, what am I going to do with it? I only started it up so I could grab the "Wardomatic" name and cybersquat until I find it necessary not to do so. Recently, two of my friends (real friends, not myspace friends) sent me invites to start up a Facebook account. Skeptical at first, I'm still trying to figure out if it's a worthy application. I can see why it's so big with students and campuses -- started up by college students, there's some sort of lackadaisical collegiate "what's up? what's goin' on?" attitude I get from the site's interface. It's a good way (and at times fun) to see what your pals are doing, but really, in the long run...is it worth it? Well, Facebook has its share of pros and cons -- 100x aesthetically better than myspace, if you ask me, with its clean design and structure. I like that. All the crazy applications gets incredibly annoying, however. Why would I want to "share a virtual beer" with anyone in cyberspace? It's one step away from Second Life, if you ask me. And I'm not down with that. I do have to say that Facebook has enabled me to find classmates I've lost track of through the years. I'm more than likely to check up on my buddies through this site than on any other community-based site, to be quite honest. 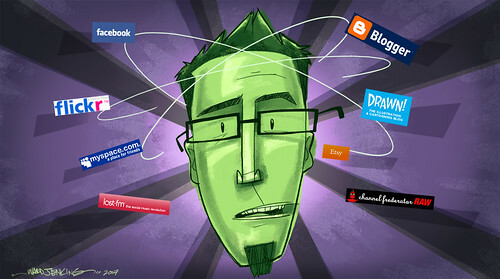 As mentioned earlier, I signed up on Channel Frederator RAW, the "social networking community for Channel Frederator." I'm enjoying the simple layout of the site, with the occasional updates from other members. I like that you can delete these updates in your profile if they're irritating you. Even though I probably won't update my profile and engage in too many conversations on the forums here, I think RAW has proven to be another successful diversion from my already-busy day. Bonus: finding fellow Portlanders that I was not aware of before joining. Another bonus: my fellow co-hort in LAIKA crime, Eric Weise is up in it, too. 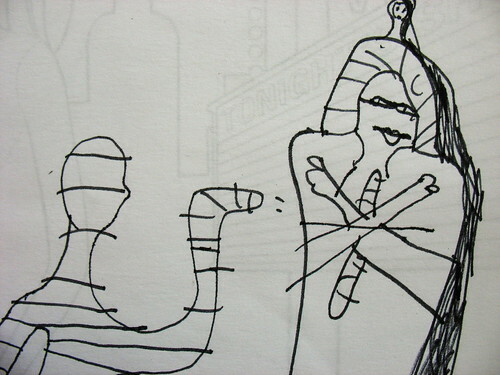 That makes two thirds of LAIKA/house's 2D directors trolling around here. UPDATE: I knew I forgot a few sites. LinkedIn is another one of those "connection" sites where I'm having a hard time trying to figure out if it's worth being a part of or not. The only thing that LinkedIn seems to be good for is accumulating "links" or people that you're connected with through businesses and former colleagues. Supposedly this is worth something in the workplace world out there, but has anyone gotten a job because of their LinkedIn account? If so, I'd like to hear about it. Of course, how could I forget YouTube? If you're down with low-fi video quality, then this is the place for you. Even with the crappy quality, Andrea and I never get tired of watching Jim Gaffigan clips. It's like we're watching our own network, which is exactly what the people at YouTube want. Don't expect me to find the time to actually favorite clips. There are a few that I've favorited, but that's about it. Don't have enough time to search videos all day. 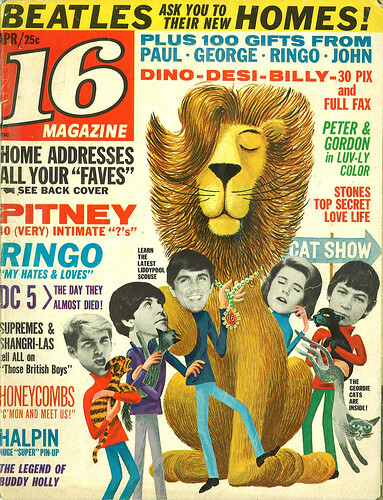 My Mom was a big fan of The Beatles, right at the height of their popularity, from 1964 to 1966. (Remember, she wrote this previously.) 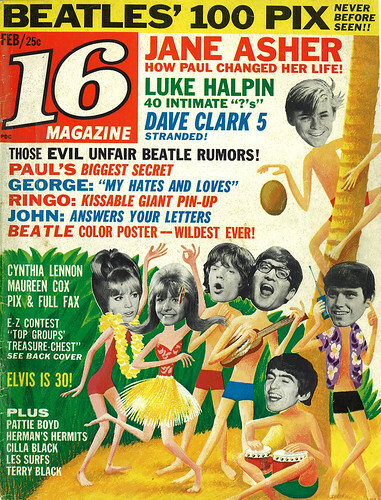 She had a big collection of teeny-bop magazines that featured all the big hot movie, tv and music hearthrobs at the time. 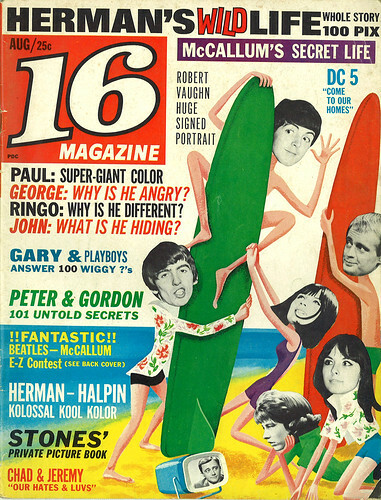 She would only buy the ones that had anything to do with The Beatles, most importantly Paul. She was a big fan of Paul. 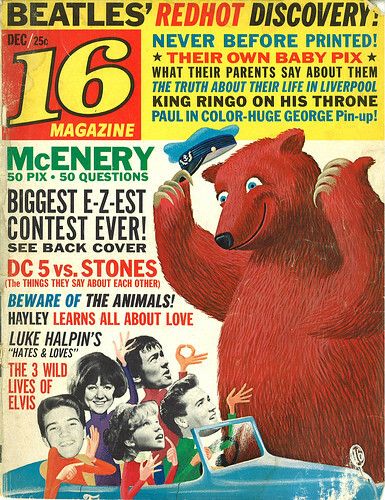 Growing up, I remember digging these 16 Magazines out of the closet and checking out all the covers, studying in detail all the fun and kooky cartoon activity going on. Big source of influence for me right here, folks. Loved how all the run-of-the-mill press photos were transformed into brand new scenarios by ingenious positioning and pasting. I really admired the artist who worked on these covers -- I could tell that they had to work with only what was available, and that inspired me. Check out the entire set HERE. 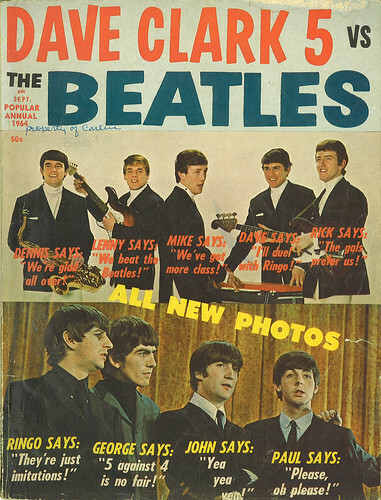 Mom had some other publications in her collection, mostly one-shot deals that were basically 'special issues' from 16 Magazine or Photoplay. 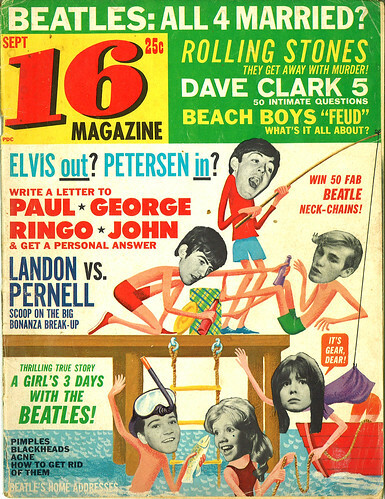 Here's one specializing in the Great Debate of 1964: Who's better -- The Dave Clark 5 or The Beatles? Oh, the world must know! 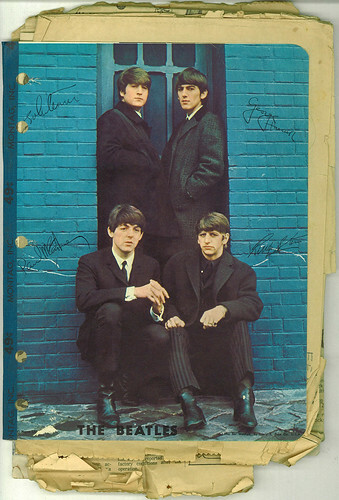 Thanks, Mom, for being a teenager and being so passionate over four mop-tops from Britain. 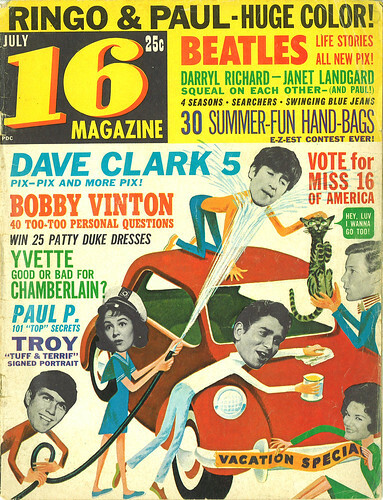 And thanks for keeping these fun & silly magazines around the house as a souvenir so that they may become a big influence on my creative upbringing. 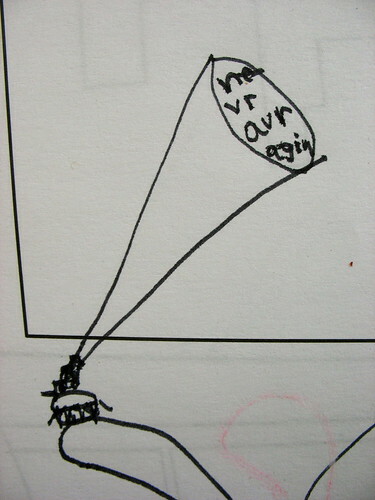 You never know what will influence young, budding artists. 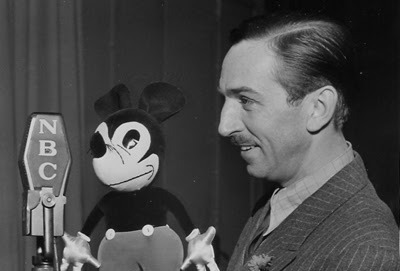 Photo of Mickey & Friend via Didier Ghez's excellent Disney History. 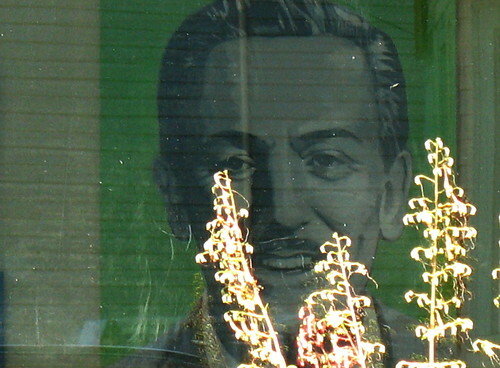 As I mentioned in an earlier post, I was reading Neal Gabler's biography on Walt Disney, Walt Disney: The Triumph of the American Imagination. It took me nearly 3 months because the book is a beast, not to mention it was so hard for me to eek any sort of time out of my busy schedule in order to read it. The book has caused quite a stir among animators and historians in regards to how Gabler portrays Disney, so of course this piqued my interest. What piqued my interest even further was the fact that one of said historians was Michael Barrier, who in fact recently wrote his own biography of Walt Disney: The Animated Man: A Life of Walt Disney. Being a frequent reader of Barrier's blog/site, I was made very aware of his thoughts and opinions about Gabler's book. Let's put it this way: he has a few problems with it. And he doesn't hold back. Reading his posts and others' comments on various blogs and sites, I decided to try out something. I decided to first read Gabler's bio on Disney and then read Barrier's. Maybe do a compare & contrast and offer my thoughts on both books. I might even conduct an interview with Barrier himself, to get his thoughts on writing a biography of a figure so central to the animation industry past and present; one that's so mired in curiosity and controversy. Anyway, just thought I'd clue you in on all this. I'm currently in the middle of Barrier's book now and I can say that honestly, it's an entirely different book from Gabler's. Stay tuned. Barrier's previous book is Hollywood Cartoons: American Animation in Its Golden Age, a massive tome that practically took over 25 years to write, the fruit of over 200 interviews with animation artists and creators. I highly recommend this book to those who crave to know more about how animation got started and how it flourished during the Golden Age. Ava's not the biggest fan of Barbie -- she moves from one interest to the next with the faintest of breezes -- but she does have several Barbie branded items. One of these is this large coloring and activity book. 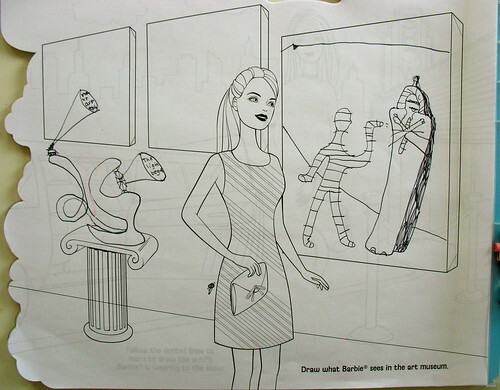 In it, Barbie goes to the art museum and here, you'll see, they ask for the child to draw what Barbie sees at the museum. Ava drew an interesting Egyptian themed painting on the wall, and an equally interesting "modern" sculpture over to the left. Let's take a closer look at the painting, shall we? 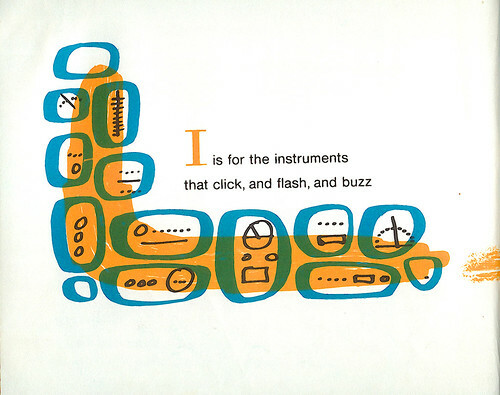 A closer look at Ava's 'modern' sculpture over on the left of the page. Getting even closer, we see some sort of creature (?) projecting up on the wall "Never Ever Again." Okay. I'll just leave it at that. Is it a spiderweb? A lens of some sort? I dunno, but I like it. 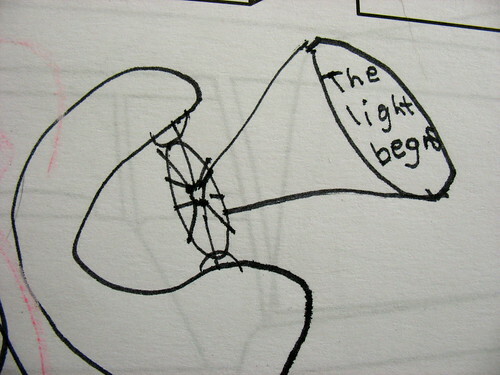 It says: "The Light Begins." I like how my daughter's mind works when it comes to her version of what a museum is about -- a little bit of history with the Egyptian elements, and a little bit of art with the abstract sculpture. 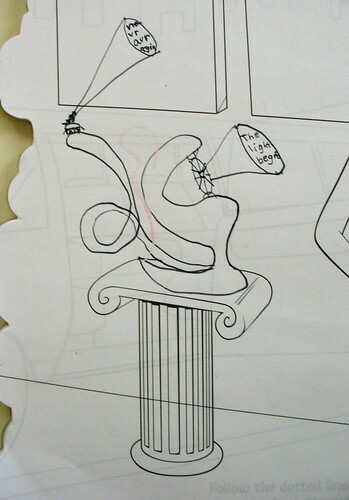 About the other items on the sculpture -- What could they be? Video projection? Talk balloons? Maybe, maybe not. I'm at a loss with that one. But if there's anything that I've gleaned from looking at Ava's drawings and artwork throughout the years is that it's best not to ask. Just let the art speak for itself. I was sitting in our car reading a book waiting for Andrea and Ava while they were shopping on Alberta Street about a month ago. The book I was reading was Neal Gabler's biography on Walt Disney. (I'll explain later.) As I was reading, I had a strange feeling that someone was watching me so I looked over to my left, where there was a coffeehouse. Hmmm....nothing. Upon closer inspection, there was someone watching me! What are the odds that I would be sitting in a car reading a biography of the man who just so happened to have a huge portrait painted of him hanging up in the coffeehouse that's across the street from me? 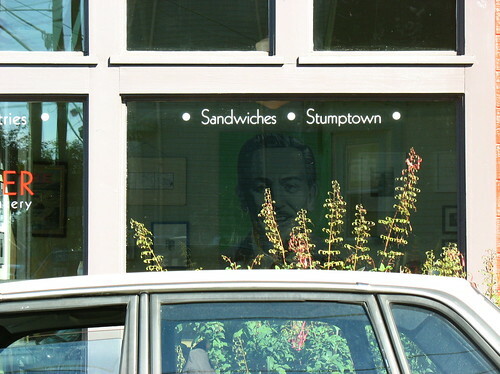 In Portland, of all places? 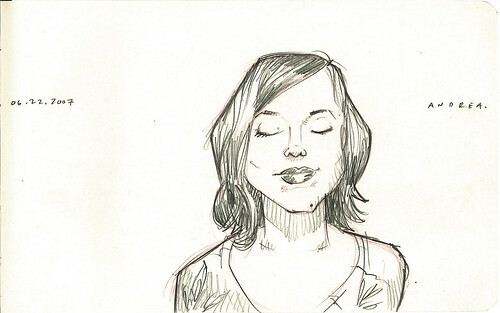 Drawn from this photobooth strip. I know that she'll be embarrassed by this attention, but I don't care. My wife is beautiful. Absolutely gorgeous. And I adore her with all my heart. Found on the side of a local middle school. 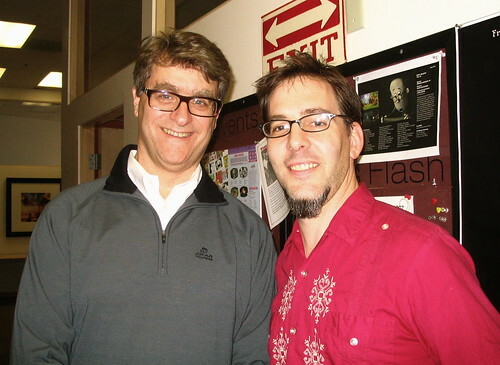 Guess who stopped by the studio yesterday: Fred Seibert of Frederator. We met briefly back in June during PLATFORM, but the club that we were at was so loud that we weren't able to conduct a feasible conversation. Either that, or my freakishly wild beard got in the way. Fred came by to talk about his career and did a Q&A session afterwards. Open and outspoken, Fred was a hoot to listen to. Afterwards, he practically put a gun to my head, forcing me to sign up on Channel Frederator RAW, an online animation community. (Not like I've got enough internet stuff going on, right?) Ah, that Fred -- he's so persuasive! Great to finally talk, Fred! Hope to see ya again soon. Be sure to check out Dan Meth's hilarious series, The Meth Minute 39. Simple Flash animation, but doable for me because of the timing and humor. And no, RUSH is not heavy metal. Sorry, Dan. Oh, and a big THANKS for everyone who's emailed me with their linky links. I plan on tackling my template code this weekend, so look out for that. I really appreciate the response. I'm hoping that this'll help other NW artists out there stay connected. It's amazing to realize just how much talent is out here. Ugh. Just look at how old my links are there. I still have my Atlanta linkage up, plus, some of the other links are old and broken. Time for an overhaul, don't you say? I've been compiling some local links of fellow LAIKA-ians and other artists, animators and illustrators in the Portland area -- in fact, I'm thinking about making a Northwest section as well. I know that I'm only scratching the surface, so I need your help. 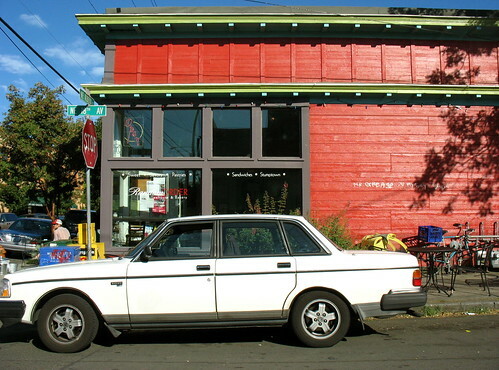 If you happen to be from Portland and/or know anyone from here who is an artist and/or animator, please let me know. I'll put the link up as part of my brand spankin' new blogroll and linky links. Just email me or put in the comments section for this post. Make sure you let me know where the subject is from, whether from Portland or the general Northwest area. Thanks! 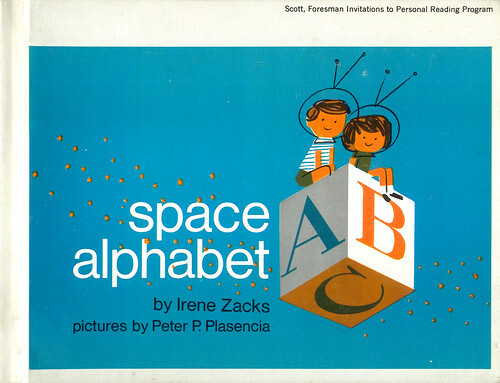 In honor of Sputnik 1, 50 years later (on Oct. 4th), I present to you all a nice little gem of a book I got off of ebay about a year ago: Space Alphabet (1964) by Irene Zacks. Pictures by Peter P. Plasencia. 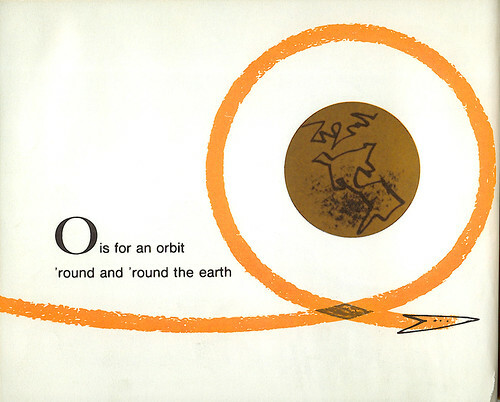 I found out about this book by checking out Dreams of Space: Space Art in Children's Books, which I bookmarked ages ago. It wasn't until just last year when I decided to see if there were any available on ebay, and sure enough, I found one! It was a library book, but I didn't care because it was listed has not having any marks inside. 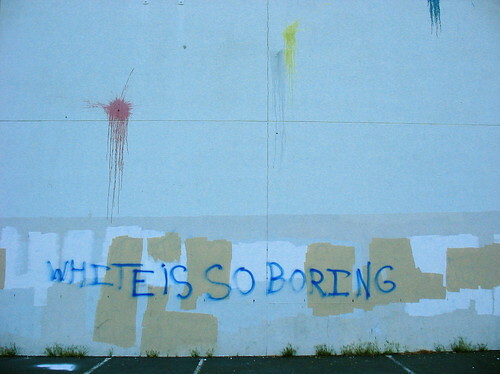 (Always a downer.) I normally don't scan an entire book, but here I made an exception because of just how cool the images were by Peter P. Plascencia. Simple, bold and direct. No excess details. Something to be learned from this, people. I'm serious. Pay attention to how he composed each page. I scanned the entire page -- no cropping at all -- so you can see how it looks to the viewer/reader. Nice balance between positive and negative space. 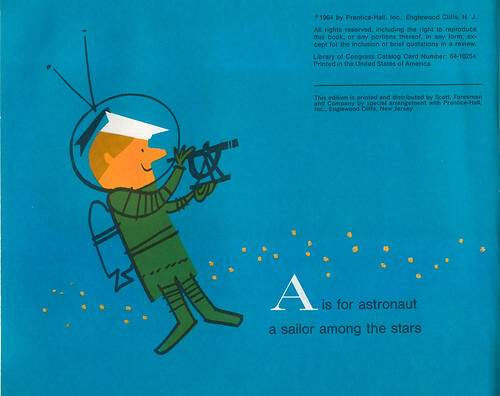 Not much about Plascenica out there in the internets, but the Dreams of Space site does feature his bio from the book. Ava had a blast reading this book to Ezra the other night. 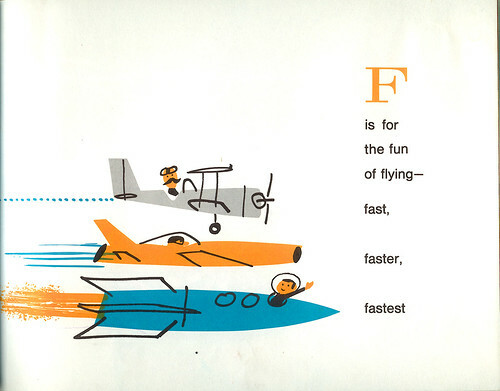 Very fun imagery with simple colors and simple text. 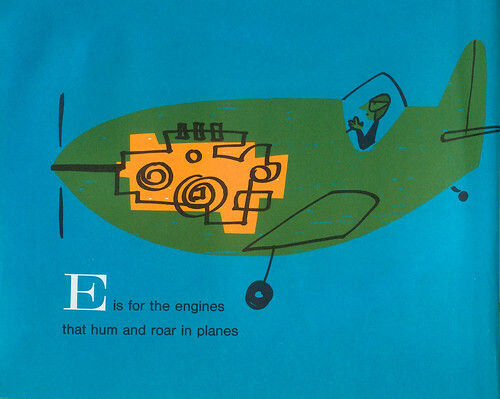 Not often do you get the word "dirigible" in a children's book. 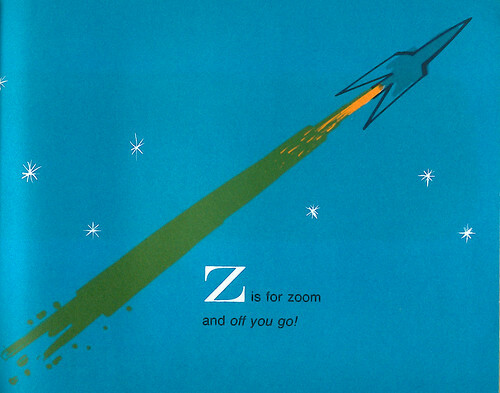 Ezra was a little upset that E was for "Earth" and not "Ezra." Seemed a little confounded by that one. 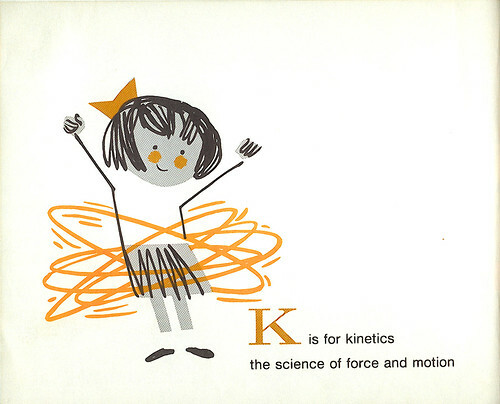 View the entire book here: Space Alphabet: Flickr set. Hey, checkit. LAIKA! 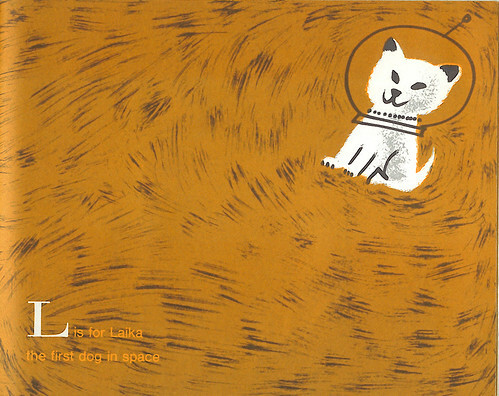 By the way, not only is "Laika" the name of the first dog in space, it is the name of a dog breed from the word Layat, which means to bark. (Thanks, Lev!) 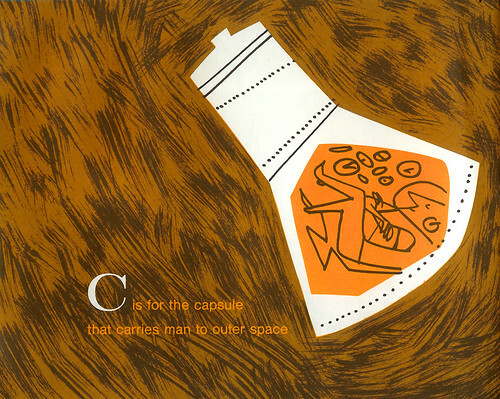 FYI: Laika was on board the second Sputnik mission: Sputnik 2.